Two Battalions of the Sherwood Foresters, the 2/6 and the 2/7th of the Notts. and Derby Regiment (some 1750 troops), were mobilised on Tuesday 25th April, a day after the Rising was declared to support the British troops already in Ireland. The majority of these troops (commonly known as the Robin Hoods), were quite young and recently recruited. They were training for battle on the open fields of the Western Front rather than the house-to-house warfare they were to be confronted with in Dublin. They took an overnight from Liverpool to Kingstown (now Dún Laoghaire), and early Wednesday morning marched in columns four abreast the nearly 10 km up the coast road to the city centre where they met fire by Michael Malone and Seamus Grace at 25 Northumberland Road. 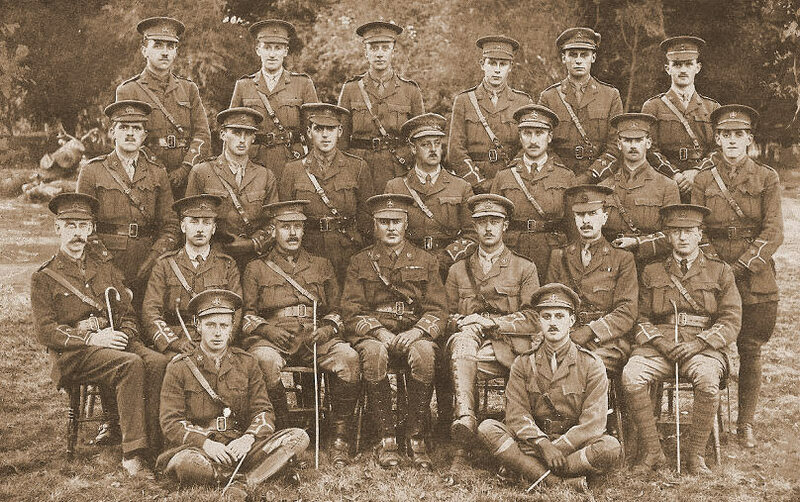 Sherwood Foresters officers photographed in 1915. Two of the officers in this photo, Frederick Christian Dietrichsen, and Percy Vivian Claude Perry, died taking part in the Battle of Mount Street Bridge. Frederick Christian Dietrichsen, captain, 2/7 Sherwood Foresters and adjutant, C company. Dietrichsen was killed by fire from No. 25 Northumberland Road and was among the first casualties of the battle. Frederick Christian Dietrichsen (1882-1916), captain, 2/7 Sherwood Foresters and adjutant, C company. Born in Essex on 30 October 1882, Dietrichsen was 33 years of age in April 1916, the son of James and Elizabeth Dietrichsen. He was first educated at Chigwell School and then graduated from Gonville and Gaius College, Oxford in 1904. Called to the bar in 1907, Dietrichsen went on to become a well-known and popular lawyer in Nottingham. In 1910 he married Beatrice Mitchell, an Irish Protestant, and the couple had a son and a daughter (Cliff Housely; CWGC; Irish Times, 6 Apr. 2015). 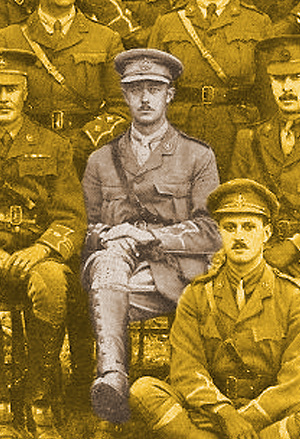 On the outbreak of war in August 1914, Dietrichsen enlisted in the 2/7th Sherwood Foresters, having earlier been a member of the Officer Training Corps at Cambridge. He received a commission as 2nd Lieutenant in November 1914 and was promoted to temporary captain in October 1915 (Cliff Housely; Irish Times, 6 Apr. 2015). Dietrichsen landed with his battalion at Kingstown (Dun Laoghaire) on the morning of 26 April 1916. As he marched towards the city centre, he noticed his wife and children among the crowds who had lined the streets to cheer the soldiers and broke ranks to embrace them. He had been unaware that they were in Dublin – his wife had travelled to stay with her mother in Blackrock – and he had believed they were in Watford (Irish Times, 6 Apr. 2015). Less than two hours later, Dietrichsen and his men were fired at by Volunteers Michael Malone and James Grace in No. 25 Northumberland Road. Dietrichsen was fatally wounded and was among the first casualties of the battle (“The Robin Hoods”, 1/7th, 2/7th, 3/7th Sherwood Foresters, 1914-1918, 1921). A resident of Northumberland Road later wrote to his wife of his bravery and remarked that ‘he had no regard for his own safety’ (Irish Times, 6 Apr. 2015). Frederick Dietrichsen is buried in Deansgrange Military Cemetery, Dublin (CWGC). William Victor Hawken, 2nd lieutenant, C Company, 2/7th Sherwood Foresters. Hawken was killed by rifle fire from No. 25 Northumberland Road while attempting to make his way along Haddington Road. William Victor Hawken (c. 1885-1916), 2nd lieutenant, C Company, 2/7th Sherwood Foresters. The son of parents from Chichester Street, London, Hawken was 31 years of age in April 1916. 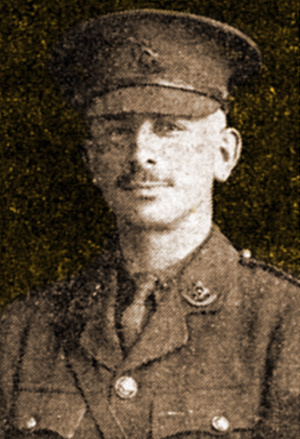 Prior to the outbreak of war in August 1914, Hawken served as a platoon sergeant in the London Irish regiment of the British army (Cliff Housley; CWGC). In 1914, Hawken joined the Inns of Court Officer Training Corps and received a commission in the 7th Sherwood Foresters in early 1916. He then joined the 2/7th Sherwood Foresters in Watford as a 2nd lieutenant and was attached to C Company (Cliff Housely). Hawken landed with his battalion at Kingstown (Dun Laoghaire) on the morning of 26 April 1916. C Company were first to come into conflict with the Volunteers at No. 25 Northumberland Road. Dawken was moving along Haddington Road attempting to turn right at Percy Place and reach Baggot Street Bridge but was killed by rifle fire from No. 25 (“The Robin Hoods”, 1/7th, 2/7th, 3/7th Sherwood Foresters, 1914-1918, 1921). William Hawken’s body was hastily buried after the battle but was exhumed and reinterred in Westminster City Cemetery, Hanwell, London (TNA, WO 35/69/1; CWGC). Harold Charles Daffen, lieutenant, B Company, 2/8th Sherwood Foresters. Daffen was killed leading a charge across Mount Street Bridge towards Clanwilliam House. Harold Charles Daffen (c. 1894-1916), 2nd lieutenant, B Company, 2/8th Sherwood Foresters. Born in Worksop, Nottinghamshire, the only son of Charles and Anne, Daffen was first educated at the King Edward VI Grammar School in Retford. He was then a student in Sheffield University and later Oxford University, where his studies were interrupted by the war in 1914. In both universities he had been a member of an Officer Training Corps. Daffen was given a commission as 2nd lieutenant in the 2/8th Sherwood Foresters in 1914 and was later promoted to lieutenant. He won prizes for musketry and marksmanship in both the OTC and the army (Housley). Daffen landed with his battalion at Kingstown (Dun Laoghaire) on the morning of 26 April 1916 and took charge of B Company in the absence of the company captain who had taken ill. The 2/8th battalion, which had been in reserve, were called in to action on Northumberland Road after the 2/7th had suffered heavy casualties. Daffen led B Company on a charge towards Clanwilliam House but, having made it across Mount Street Bridge was shot and killed instantly by rifle fire just beyond the north-west corner of the bridge. Daffen was mentioned in despatches for his bravery during the battle (History of the 2/8th battalion, Sherwood Foresters, 1914-18, 1920; CWGC). He was 22 years of age. Harold Charles Daffen’s body was hastily buried near Mount Street Bridge but was exhumed and reinterred in an officer’s plot at Grangegorman Military Cemetery, Dublin (TNA, WO 35/69/1; CWGC). Montague Bernard Browne, 2nd lieutenant, B Company, 2/8th Sherwood Foresters. Browne was killed during a charge across Mount Street Bridge towards Clanwilliam House. Montague Bernard Browne (c. 1877-1916), 2nd lieutenant, B Company, 2/8th Sherwood Foresters. 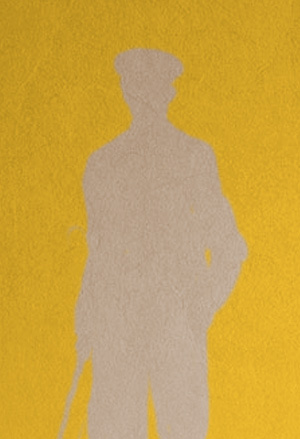 Browne was 39 years of age in 1916, the son of the late Reverend Samuel Ernest Browne and his wife Mary. From Nottinghamshire, he was educated at Harrow Public School (Housley, CWGC). 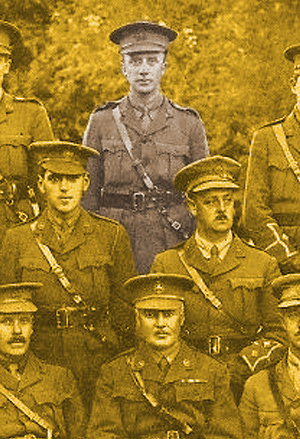 Browne first enlisted as a private in the 2/8th Sherwood Foresters after the outbreak of war in 1914. He received a commission as 2nd lieutenant in July 1915 (Housley). Browne landed with his battalion at Kingstown (Dun Laoghaire) on the morning of 26 April 1916. The 2/8th battalion, who had been in reserve, were called in to action on Northumberland Road after the 2/7th had suffered heavy casualties. Browne was a member of B Company who, under Lieutenant Daffen, made a charge across Mount Street Bridge towards Clanwilliam House. Browne made it across the bridge but was shot and wounded just beyond its north-west corner, next to Lieutenant Daffen who was killed instantly. The regimental history states that Browne died of his wounds two days later but his date of death with the Commonwealth War Graves Commission is 30 April 1916 (History of the 2/8th battalion, Sherwood Foresters, 1914-18, 1920; CWGC). Bernard Montague Browne is buried in Deansgrange Military Cemetery, Dublin (CWGC). Percy Vivian Claude Perry, lieutenant, 2/7th Sherwood Foresters. Perry was killed during an advance on Mount Street Bridge. Percy Vivian Claude Perry (c. 1883-1916), lieutenant, 2/7th Sherwood Foresters. Perry was 33 years of age in April 1916 and was the son of G. H. Perry of Forest Road, Nottingham. He was married to Hilda Perry. Browne first enlisted as a private in the 2/8th Sherwood Foresters after the outbreak of war in 1914. He received a commission as 2nd lieutenant in March 1915 and was later promoted to lieutenant (Housley; CWGC). 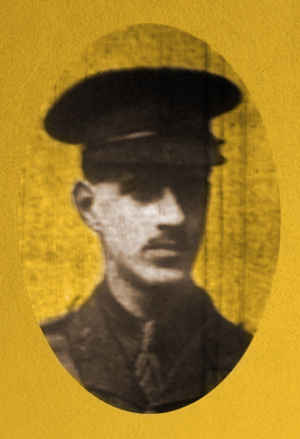 Perry landed with his battalion at Kingstown (Dun Laoghaire) on the morning of 26 April 1916 and was killed in action during the battle at Mount Street Bridge (Housley). Percy Vivian Claude Perry is buried in Nottingham General Cemetery (CWGC).